Shanthi Gears traces its rich heritage of engineering way back to 1960, when P Subramanian, an engineer himself, laid down the foundation with a modest small gear manufacturing unit in the town of Coimbatore. 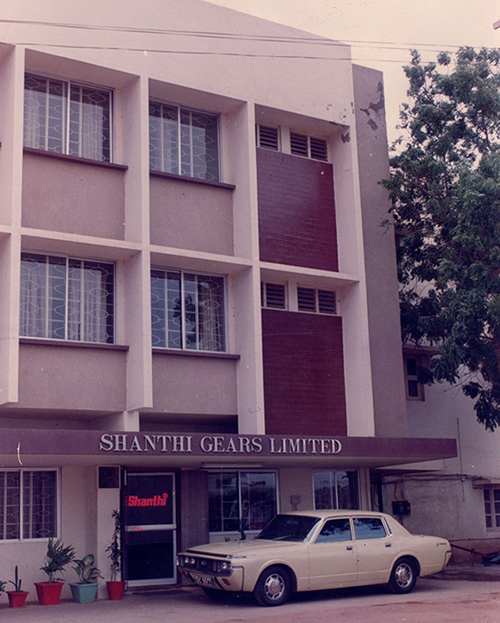 Shanthi Engineering and Trading Company, the precursor to Shanthi Gears, that started with simpler processes like milling, grew continuously under visionary leadership and with the toil of its people to become in 1972, a private limited company—Shanthi Gear Products (P) limited. It is this strong early foundation that allowed us to build on, to increase our capabilities to include progressively complex engineering jobs—from milling to independent units, fully manned by skilled technicians for manufacturing Patterns, Centrifugal Castings of phosphor bronze rings, Ferrous Castings, Aluminum Castings, Heat Treatment, Forgings, Fabrications and Cutter Manufacturing. These added to our in-house strength and with every new domain strength added to our business, we grew, leading the gear business in India, from the front.